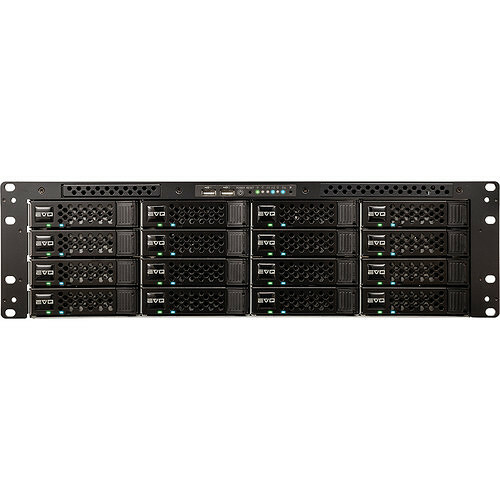 The EVO 16TB 16-Bay NAS Server from Studio Network Solutions is fast, easily expandable, and an ideal fit for businesses looking for a shared media storage server. It features a total of 16 bays and comes with four 4TB hard drives preinstalled for a total capacity of 16TB. The EVO not only supports hard drives in RAID 0, 1, 4, 5, and 6 configurations, but also solid-state drives in JBOD or RAID 0 only. With a max sustained system throughput of roughly 2.5 GB/s, the EVO can support demanding video such as 6K, 4K, 10-bit uncompressed HD, and stereoscopic 3D, all over 10GbE Ethernet or Fibre channel. Should you need to expand, you can purchase additional drives or even an expansion unit for additional capacity. The EVO offers project sharing, bin sharing, file sharing, and SAN & NAS for professional media applications. You'll have access to multi-user write workspaces for sharing projects and bins, in addition to high performance SAN volumes for multi-cam and uncompressed workflows. The EVO supports plenty of Ethernet and Fibre Channel ports to directly connect every computer in your workgroup. It supports up to a max of 28 GbE ports, 12 10GbE Optical Ports, 8 10GbE Base-T ports, and 2 Fibre channel ports. Caching helps to handle more video streams per array, so you can do more with a fewer amount of disks for a less expensive and more reliable storage solution. Multipathing increases transfer speed by taking advantage of both Fibre or Ethernet paths and combining them for a higher SAN throughput. With a total capacity of 16 drives, the EVO has room to grow as your business expands. When you need more, you can connect additional expansion units to hold up to a total of 80 disks. Up to 28 users can be directly attached to the EVO at once, and if you need to support more, you can connect any available Fibre channel or Ethernet port to a switch. ShareBrowser is a unified file/project/asset management interface for macOS and Windows systems. It's similar to the Finder/Explorer tab but is designed by SNS specifically to help media teams work and collaborate more efficiently. With the EVO's recycle bin, you can easily restore deleted files and even configure when the trash should be completely removed. Plug in USB drives and card readers directly to the EVO's on-board USB ports and they'll show up automatically to your users. Add additional storage that can be accessed just like any other workspace using Cloud services such as Dropbox and Adobe Creative Cloud. The EVO can connect to a remote authentication server to get access user names and groups. You can then assign permissions based on these accounts for easier management.